How Do We Detect Neutron Stars? What Happens When a Meteoroid Enters Earth's Atmosphere? Far from being a body at rest, the Earth hurtles through space at 67,000 miles per hour (107,000 kilometers per hour) in its orbit around the sun. At that speed, a collision with any object in its path is bound to be eventful. Fortunately, the vast majority of those objects aren't much larger than pebbles. When a collision with such a particle happens at night, observers on Earth may witness a shooting star. The space through which the Earth moves isn't empty -- it is filled with dust and small particles left over from comets or the breakup of larger rocks called asteroids. These small particles are called meteoroids. It's common for the Earth to collide with one of these particles -- or many at the same time. As they fall through the atmosphere, they quickly burs up and turns into meteors, or shooting stars. If the particle is large enough to survive its trip through the atmosphere and fall to the ground, it becomes a meteorite. The relative speed of a meteoroid to the Earth at the moment of collision is typically in the range of 25,000 to 160,000 miles per hour (40,000 to 260,000 kilometers per hour), and friction with the air particles in the upper atmosphere immediately begins to burn off the outer layer of the object. Small particles are usually completely consumed, but moderately sized ones may survive to the point where they completely lose their cosmic velocity and begin to fall to the ground under the force of gravity. Scientists call this the retardation point, and it is typically several miles above the ground. The process by which a meteor glows when moving through the upper atmosphere is called ablation, and it stops at the retardation point. If the meteor hasn't been completely consumed, it falls to the ground as a dark rock. Scientists believe that meteorites are probably cool when they hit the ground, because the hot outer layers have all fallen away during ablation. Approximately 10 to 50 such rocks hit the Earth every day, with about two to 12 being potentially discoverable, according to the American Meteor Society. Large ones are named after the place at which they are found. Some notable ones are the Nantan meteorite that fell in China in 1516 and the Launton meteorite that fell in England in 1830. Meteoroids weighing more than about 10 tons (9,000 kilograms) retain some of their cosmic velocity and hit the ground with more force than smaller ones. 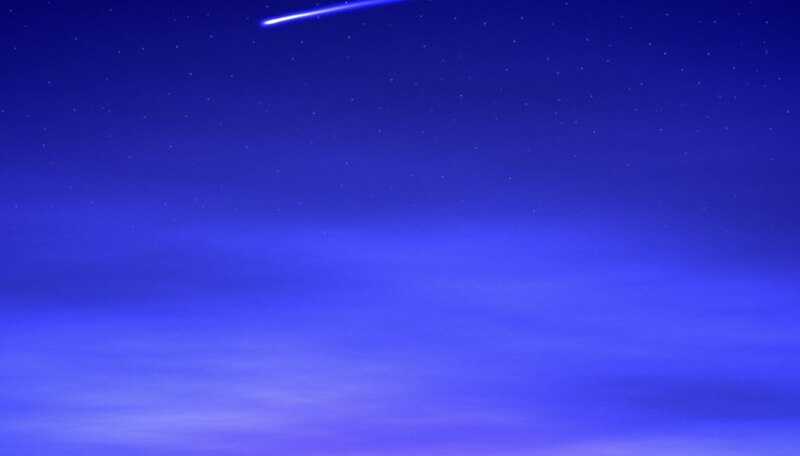 For example, a 10-ton meteoroid can retain about 6 percent of its cosmic velocity, so if it's originally moving at a speed of 90,000 miles per hour (40 kilometers a second), it can hit the ground at a speed of 5,400 miles per hour (2.4 kilometers per second), although a considerable portion of it would have burned away. Atmospheric drag would have a negligible effect on a meteoroid with a mass of more than 100,000 tons, or 90 million kilograms. Deziel, Chris. "What Happens When a Meteoroid Enters Earth's Atmosphere?" Sciencing, https://sciencing.com/happens-meteoroid-enters-earths-atmosphere-3611.html. 25 April 2017.